Affiliate marketing in the luxury industry has been heating up in 2014 and while it’s nothing new to the scene, the digital landscape now has a lot more potential customers than ever before. Since I come from an affiliate background, I thought I’d share some of the top programs that have been working for me here in 2014 and hopefully help grow your online income in the coming years. Bear in mind that it’s not as easy as slapping up a microsite and ranking to make money; snagging a high net worth individual takes work as well as a site that has brand trust of its own. Finding the right programs that actually have staff with affiliate knowledge and know-how is also hard, so this is why I decided to put this list together. I will update it yearly but also encourage our readers both old and new to leave their trusted favorites in the comments below. 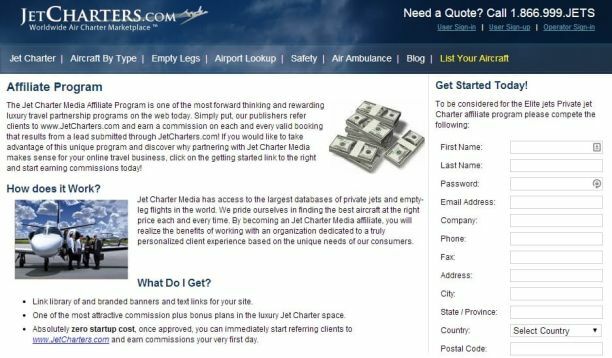 There’s no bigger name in online private jet bookings than JetCharters.com, and that is largely due to their well-organized site, huge private jet/empty-leg flight database, and – of course – their popular affiliate program. They use a classic referral system, where each booking made via a lead to their site scores you a commission. If you’re running referral sites you naturally want to partner up with sites that offer great services at great prices because your visitors are more likely to actually book with them, and this is definitely one of those sites. 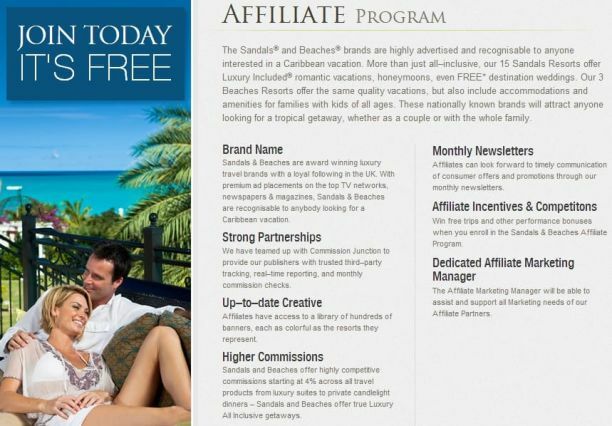 When it comes to making money off of all-inclusive resorts, the Sandals Resorts Affiliate Program is one of the best there is. Sandals is a name that everybody knows and trusts, and they’ve got enough locations to interest just about anybody heading to the tropics. Their commissions start at 4% and can go up depending on how much business you can drum up for them. Best of all, they use 90-day cookies so if any visitors find them through you, then come back to actually book two months later, you’ll still get the money you deserve as the original referrer. 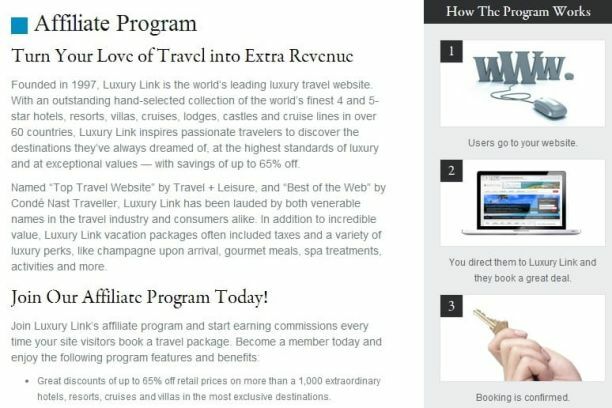 As we all know, the luxury travel market is booming these days, and you can definitely get a piece of that action by partnering with Luxury Link. 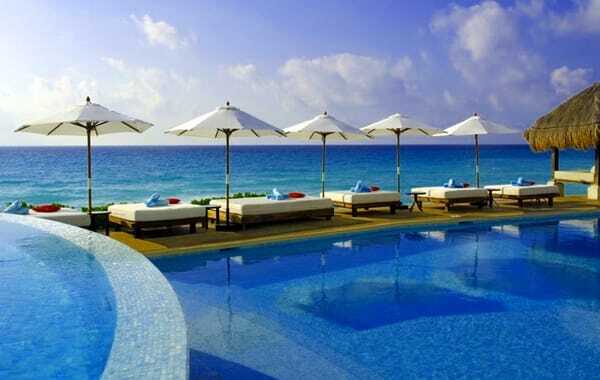 Luxury Link is where people of means go to find truly exquisite vacation destinations, from cruise ships and 5-star resorts to private sun-soaked villas and ancient castles. Their commissions range from 4-6%, which can quickly add up when you’re discussing high-end accommodations that can easily cost hundreds of dollars per night. They use 60-day cookies, so while it’s not quite as long as Sandals, they’ll still help you score those delayed commissions. Yachts are another popular way for the wealthy crowd to enjoy their travel time these days, and on that front there is no better choice than the Boatbookings.com Yacht Charter Affiliate Program. Since Boat Bookings is itself a sort of referral program that sends leads to yacht companies and owners, they actually split their own commissions with you every time someone you send books a yacht through them. Since each yacht company has its own commission rates, your earnings will vary from booking to booking. The smartest move here would be to find the individual yachts with the highest commission rates, and promote them over others to maximize your earnings. Amazon has without a doubt the world’s most popular affiliate program, and I know of some affiliate sites that make literally 100% of their earnings through it. For the luxury market, Amazon has so much to offer: wristwatches, jewelry, designer clothing – even gourmet food! Amazon’s commissions range from 1-10% on most products, but the nice thing is that not only do you get commissions from the products you advertise, but also from any product that the shopper buys alongside it in the same transaction. If the shopper buys a few luxury jewelry pieces at once, you’ll be earning serious money for minimal effort on your part… And that’s what affiliate marketing is all about if it’s done right.